The company claims that drivers of the earphones are equipped with CSR8635 chipset and neodymium technology to give connectivity for a range of 8 metres and clear audio. Boult Audio has launched "Space" in-ear wireless Bluetooth 4.2 magnetic earphones with MIC at a price of Rs 1375. 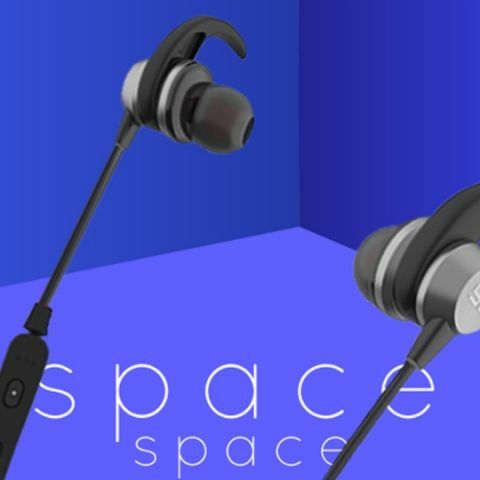 The company claims that drivers of the earphones are equipped with CSR8635 chipset and neodymium technology to give connectivity for a range of 8 metres and clear audio. Just like its name suggests, the listener experiences continuous clear audio with completely untethered out of this world audio quality. From custom-built magnetic drivers, to an impressive battery life, and an iOS and Android compatible in-line remote with mic, you can take these durable in-ear earphones anywhere life takes you. These stylish earphones sit comfortably around your neck for long sessions. The drivers equipped with CSR8635 chipset and neodymium technology give stark connectivity for a range of 8 metres and crystal clear audio. The built in micro woofer creates a high punchy bass for upbeat music and is able to balance treble and create an authentic sound. The ergonomic design of Space creates a perfect fit for the user’s ear and support passive noise isolation which gives a striking auditory experience. Ergonomically designed drivers: These aerospace grade AL alloy drivers give the best acoustic experience with 3D HD sound and smooth synchronized sound with a punchy bass. Earloop for Sport Fit: Ear loop Hold your buds in ear stably, perfectly fit for running, climbing, hiking, cycling etc. Built-in magnets can stow your headphones by wearing them around your neck anytime anywhere. Battery: Long Battery Life – The Boult Space is a powerhouse. An ultra long battery life allows the Space to play the music up to 12 hours. Ipx4 Water and sweat proof: Nano coating protects the earphones from sweat and water when exercising and during rain. Compatibility: Works with all OS, all Bluetooth enabled Smartphones, Laptops, PCs, Tablets, Smart TVs, from all the brands.